I saw Scott Pilgrim a few days ago. Was not terribly impressed. I thought it was okay. Maybe the comics are better. I dunno. Today while thinking back on good anime series, probably one of my favourites popped opped. 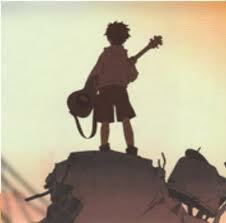 FLCL. It’s about a guy who develops superpowers, meets a mysterious girl, falls in love with her and has to do impossible battle with insane enemies. It’s filled with guitars and cartoon violence and pokes at pop and video game culture. Along the way he discovers the meaning of life, love, the universe and everything. Sounds familiar, right?Blatant Scott Pilgrim ripoff, right? Except it was done ten years ago. Hipster kids, do yourselves a favour. Get this. Watch it. Learn to appreciate subtitles. Forget about Scott Pilgrim. This is the comic/movie/whatever that Scott Pilgrim wishes it was. Who knows, perhaps it was O’Malley’s inspiration… although looking at it now, it seems a hell of a lot more like plagiarism.